Mohamed Salah has partially put Egyptian minds at rest after revealing he is hopeful of featuring at next month’s World Cup finals in Russia. 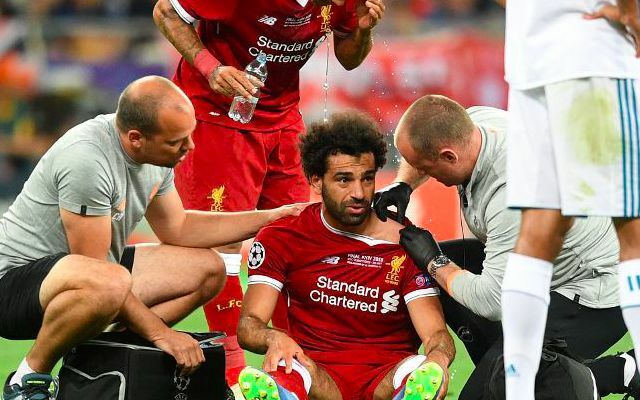 The Liverpool forward is currently nursing a suspected dislocated shoulder sustained from a heavy challenge with Sergio Ramos during Saturday’s Champions League final against Real Madrid. Salah’s night in Kiev was cut cruelly short as he was unable to continue and forced off in the 30th minute amid a dominant spell for the Reds. An ominous reaction to the injury from Jurgen Klopp after the game sparked fears over his World Cup hopes, although Salah has since maintained he is confident of leading his nation out. The hopes of a country somewhat rest on his shoulders in light of his injury-time penalty against Congo in the qualifiers dramatically securing Egypt their first spot at the tournament since 1990. It remains to be seen just how big a role he plays, with suggestions arising that Salah’s participation in the opening game against Uruguay is in doubt. To see his night on the most prestigious stage in club football end in the manner it did proved an unjust conclusion to his majestic first season at Liverpool. Whilst it begs the question as to what could have been had he remained on the pitch, it has also left Reds even more eager to see what he can produce next season.